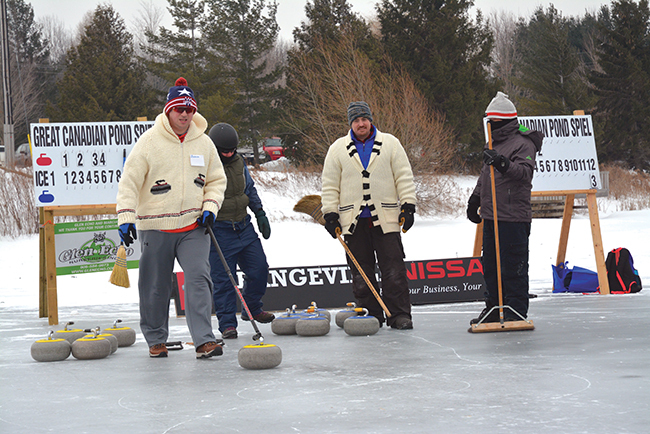 Around 100 curlers braved the elements including a strong wind whipping across the lake to take part in the tenth annual Great Canadian Pond Spiel hosted by the Orangeville Curling Club at the Island Lake Conservation area on Saturday, February 2. It was the game played the way it used to be played before curlers realized you could take part in the sport in the comfort of an arena setting. The ice conditions are no way near the smooth sheets they normally play on at the curling club but each team had the same disadvantage on the ice. It also required bundling up in several layers to keep warm. Fire pits provided some warmth for observers and a tent provided some shelter from the wind which was crossing the lake from the west at a pretty good clip. While many Club members took part, there was a large contingent of players from other clubs around the province from as far away as Ottawa who wanted to experience old fashioned outdoor curling on a frozen lake. Getting the ice ready for a day of curling is a lot of work and volunteers start the project a week in advance. No only must the ice be cleared and marked, a tent has to be set up, tables brought out on to the ice, and fire pits put in place. Then there's the matter of bringing all the curling rocks, which weigh 40 lbs. each out to the lake. Hains was one of the volunteers who help set up the ice on the lake. Conservation Area rules, the target circles could not be painted in the ice. Rather they were scratched into the ice. Curlers had to ‘read' the ice with all the bumps caused by the natural setting to make a shot. At the end of the day, scores were tallied and one team got bragging rights for the day.